When it comes to gearing up for a new season of lawn care, there are simple, routine steps outdoor power equipment owners should take when pulling lawn mowers out of winter storage. According to the experts at Honda Power Equipment, consumers should keep their product manuals handy to check for specific information related to the proper care and maintenance of their equipment. 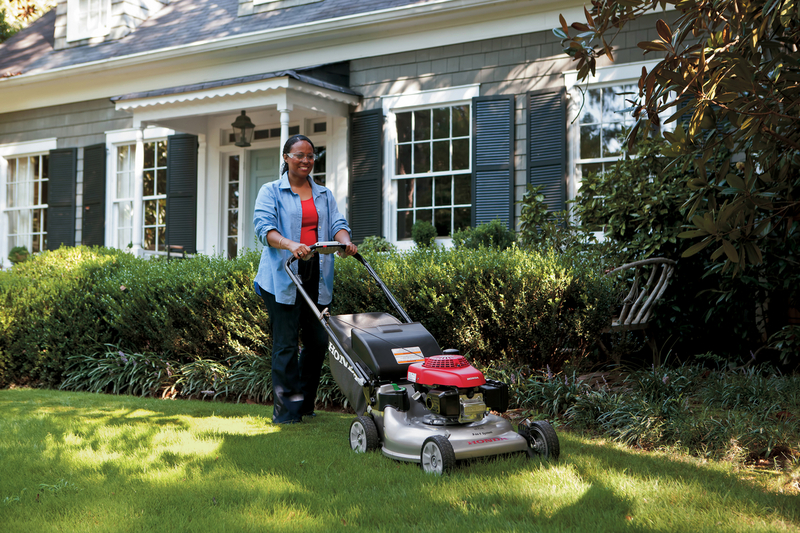 "Before making that first cut of the spring season, be sure to know the maintenance requirements for your mower," said Elisha Lipscomb, Senior Marketing Strategist, Lawn & Garden for Honda Power Equipment. "Keeping outdoor power equipment running smoothly and safely all season long is an important part of lawn maintenance." The mower must be carefully inspected at the beginning of the season. Depending on the usage, cables may need adjustment, the blades may need to be sharpened or replaced and engine oil changed. Check the blades for wear or impact damage; dull or worn blades generally result in a poor cut quality with visible brown spots on the lawn from torn or shredded grass. If the blade is worn, dull or damaged take it to an authorized Honda dealer for sharpening or replacement. Also, be sure to check the blade bolts and ensure they are tightened to the specifications in the owner's manual. Check the lawn mower bag. Clean the bag according to the owner's manual instructions, and replace the bag if it is worn, torn or clogged. A clogged grass bag will restrict air flow causing poor bagging performance, while a torn or worn bag can allow debris to pass through it – posing a risk to the operator. Frequent grass bag inspection is critical to maintaining maximum bagging performance and safe operation. Check the air filter. If the paper element is excessively dirty, be sure to replace it. Check the oil level. Start by removing the dipstick, wiping the oil from it, and inserting it back into the engine. Be careful NOT to screw it in. Then, remove the dipstick to check the level. Add oil if necessary. Check the owner's manual for the recommended type of oil. As a rule of thumb, oil should be changed once per season. If you changed the oil before storing the equipment for the winter, another oil change is not necessary. A cautionary note: small air-cooled engines may consume oil rapidly. Low oil levels can lead to an engine seizure, which would require engine rebuild or replacement. Failing to change the engine oil and check/clean/replace the air filter regularly can result in rapid engine wear, especially if a lawn mower, for instance, is used in dusty conditions. Inspect for loose bolts and fasteners as well as fuel and oil leaks. Give the engine a quick 60-second look for any fluid leaks, or loose or missing parts. This inspection may require tilting the equipment to see all sides of the engine to check the lower crank seal. Fuel tips: when storing outdoor power equipment models such as lawn mowers, it's a good idea to add gasoline stabilizer and run the engine for a few minutes outside to ensure all the gasoline in the fuel system is treated. This practice prevents fuel-related problems from occurring when the lawn mower is removed from storage. Old fuel or fuel left in the carburetor for months can cause gumming of the carburetor and the intake valve. Even fuel that's just a month old can make it hard to start the engine. In addition, allowing dirt and other contamination in the fuel tank or storage can lead to clogging of the carburetor passages and affect engine performance. If the mower was stored without proper treatment, and it is hard to start, a trip to the dealer may be necessary. When should owners turn to their dealers for serious problems and when can they 'do it themselves'? The best answer is that the owners of outdoor power equipment should not tackle maintenance if they're not comfortable doing so. For example, there are owners who should not change the oil, while there are others who would have no problem disassembling the entire engine and replacing the piston rings. The average owner should be able to do the maintenance items listed in the product manual such as changing the oil, spark plug, and air filter. A more mechanically-inclined person with the proper tools and a shop manual could adjust the valves and adjust the engine speed. Basically, an owner should look at the maintenance need and decide if he or she is truly capable of performing the task at hand. If you're in doubt, it would be advisable to take the product to a dealer. Honda Power Equipment, a division of American Honda Motor Co., Inc., markets a complete range of outdoor power equipment, including outboard marine engines, general purpose engines, generators, lawn mowers, pumps, snow blowers, tillers and trimmers for commercial, rental and residential applications.